Rick Bilozer is suing Imperial Oil for allegedly contaminating his family’s farm located between Devon and Calmar (Edmonton Journal). The lawsuit lists a string of alleged environmental infractions since 1970 that include: burial of contaminated materials that spread to groundwater and caused elevated levels of benzene, ethyl benzene, chloride, sodium, sulphates and hydrocarbons; a brush fire that spread off the lease site and set peat underneath the ground on fire for 10 years, causing the ground to cave in and form a swamp; and a number of spills on the Bilozer property including a 5,000-litre spill of oily emulsion in 1982. The Bilozers have been trying to negotiate a settlement with Imperial since 1993, but with little success. Alberta Environment formally directed Imperial Oil in 2005, 2006 and 2009 to reclaim the damaged land under the Environmental Protection and Enhancement Act, but reclamation has still not occurred. In an amazing abdication of its enforcement responsibilities, Alberta Environment has indicated they will not intervene as long as Imperial Oil is making attempts to resolve the situation, which the Bilozers obviously feel is not happening. The problem started with an agreement Imperial and Rick Bilozer’s parents originally entered into in 1952 to develop wells on 4 lease sites. Imperial Oil has a long history of environmental problems. Railroaded has been following Imperial Oil’s environmental and community relations record, since Imperial Oil, Cando Contracting Ltd. and Canadian National Railway joint ventured in the building of a rail yard in 2010 immediately adjacent to 2 wildlife conservation areas and 2 homes in Strathcona County, Alberta. Imperial is storing up to 225 tank cars with petroleum residue (up to 2,000 gallons/car) less than 30 metres from 2 wildlife conservation areas, only 68 metres from one home and 163 metres from a second home. Guidelines specify that new rail yards are not to be built less than 300 metres from any home. 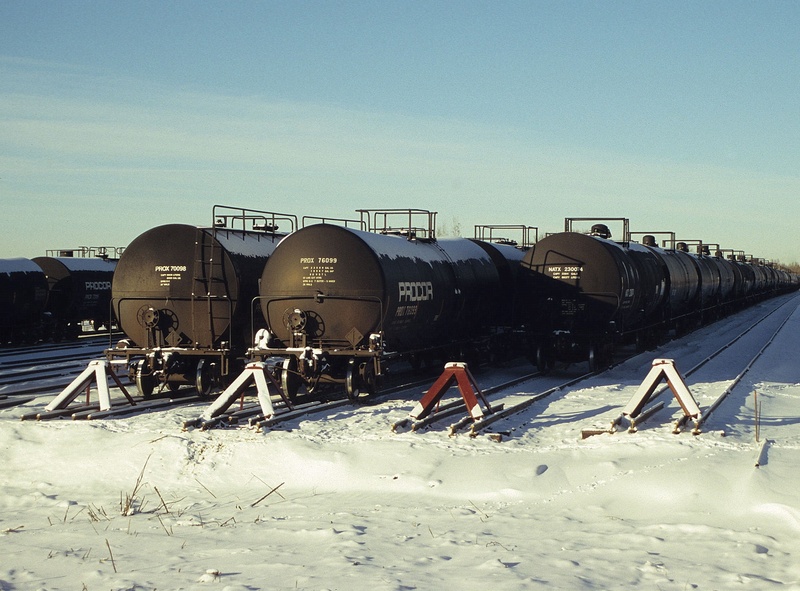 The construction and operation of the rail yard violates federal legislation, Railway Association of Canada and Federation of Canadian Municipalities proximity guidelines, Canadian Rail Operating Rules, CN policies and Imperial Oil policies. The rail yard poses a threat to the local environment and adjacent homeowners (see this link). See this link for more examples of Imperial Oil’s poor environmental and community relations record. ~ by railroaded on January 18, 2014.